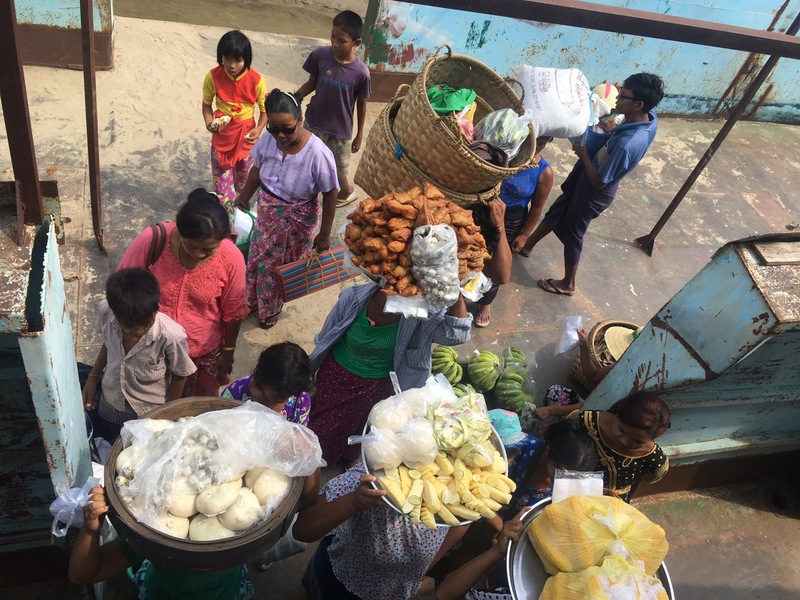 There’s no doubt Bagan is the jewel in the crown of Burma (Myanmar), and there’s no doubt to me that Burma is One if the most jaw dropping countries in the world, but even though, I wasn’t expecting this very unique experience when navigating down the Ayeryawady river. 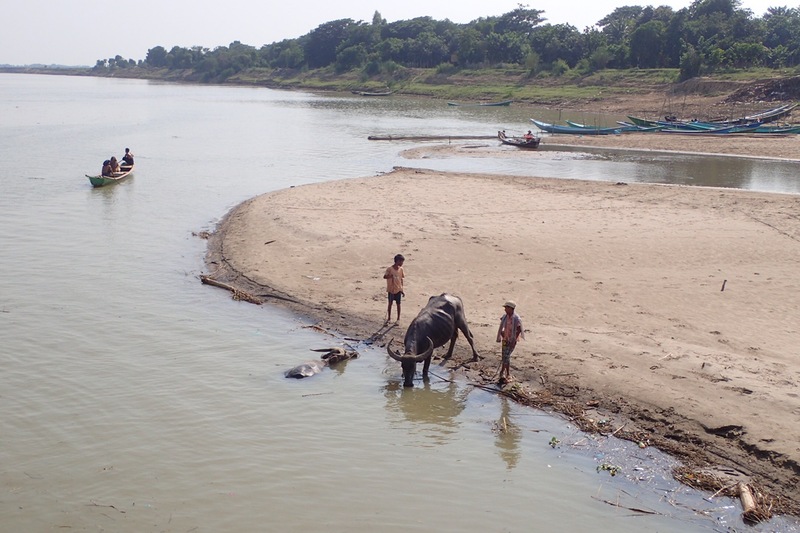 The Ayeyarwady river flows North to South and halves Burma. On its widest areas it speads over 2 km wide. It connects the fertile north to the port in the south. And although the traffic in the river has diminished since the building of roads and railways, the river is still the lifeline to many communities at its banks, and is one magic explosion of colours and life. 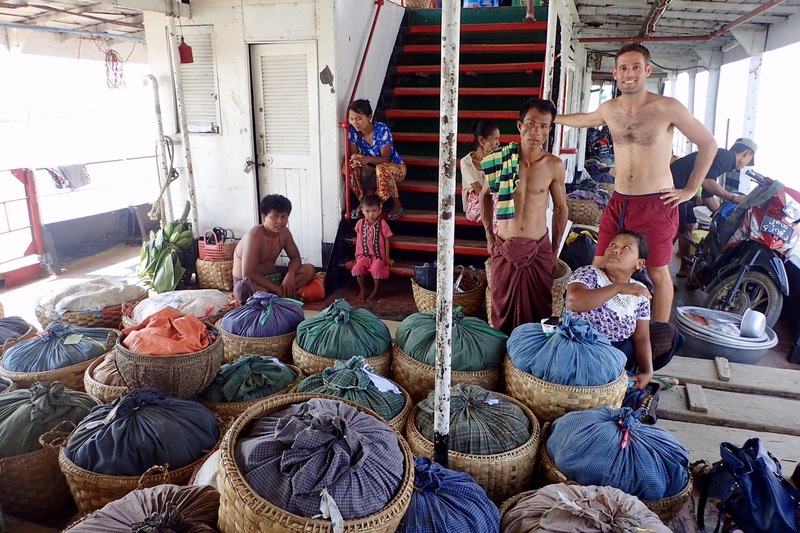 We started our journey at 5 AM in the Pier at the Western corner on Mandalay, crossed the unsteady plankboard to find an old double decked boat bared of any seating arrangemets, windows or walls. Several dozen locals spreaded their mats and sat on the floor side by side to their products to be sold somewhere down the river. Only a couple of plasic chairs were arranged for the foreigners, such as us, that didn’t bring their own mats. Some kids were very excited to be in the boat with us, and although there was no common language to communicate, some laughter was exchanged. At the first stop at the bank of the river, no pier/jetty/port, just a sand bank and a plank, a multitude of young and energetic boys were awaiting for our arrival with mounts of bags and baskets, potatos by the looks. They promptly loaded under the scorching sun all the produces and before we left they were all already inside the water bathing. Stop after stop was a parade of colors, fresh vegetables, motorcycles, flowers, plants, food vendors and more and more people came up and down the boat. Ox-carts picked up and brought more and more products as we landed in very town. 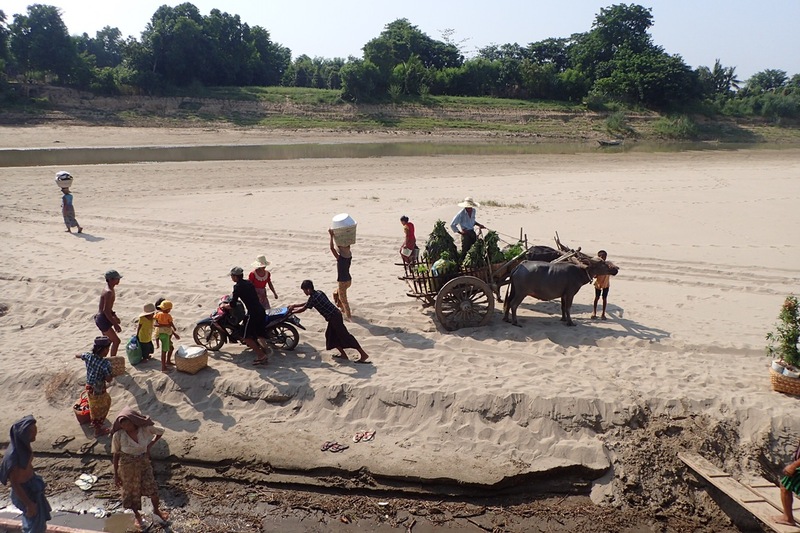 This governent owned boat runs twice weekly, Wednesday and Sundays, since it takes two days to make the same way upstream, and some of these villages depend on this only mean of transport to access other villages or the city of Mandalay. We paid only USD 15 for the ride, but my best guess is the locals get it for less. During the high season there are more private boats, for tourists: faster and much more expensive. And for sure it’s a landscape ride and not an antropological experience. 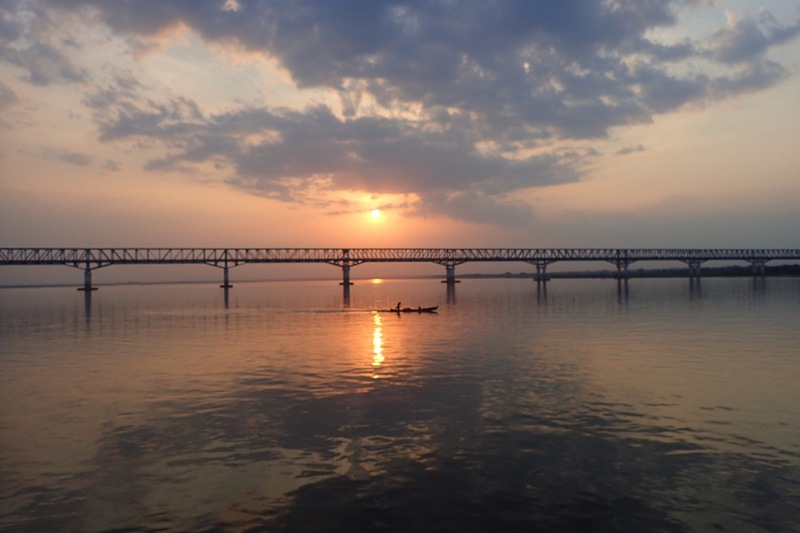 Sunset under the new Pakokku bridge, 4 km span. It took 15 hours of unbearable heat to travel the 200 km between Mandalay and Bagan, where there is no landmark or monument on the way, save for the thousands of stupas and two bridges, and yet, his has been an unforgettable trip, a kaleidoscope of colors and people using this river as their main way of transport and living, just like in the old days, a great spectacle. And we had the front row.